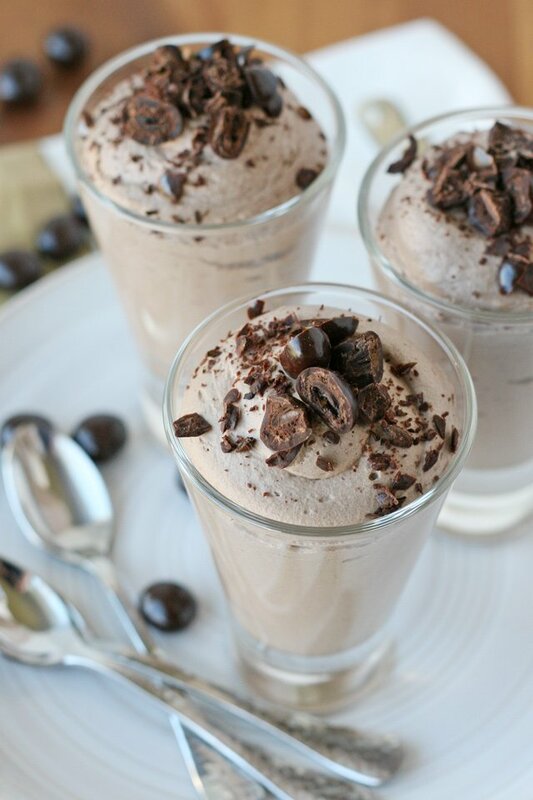 This Chocolate Mocha Mousse is creamy, fluffy, coffee flavored perfection! 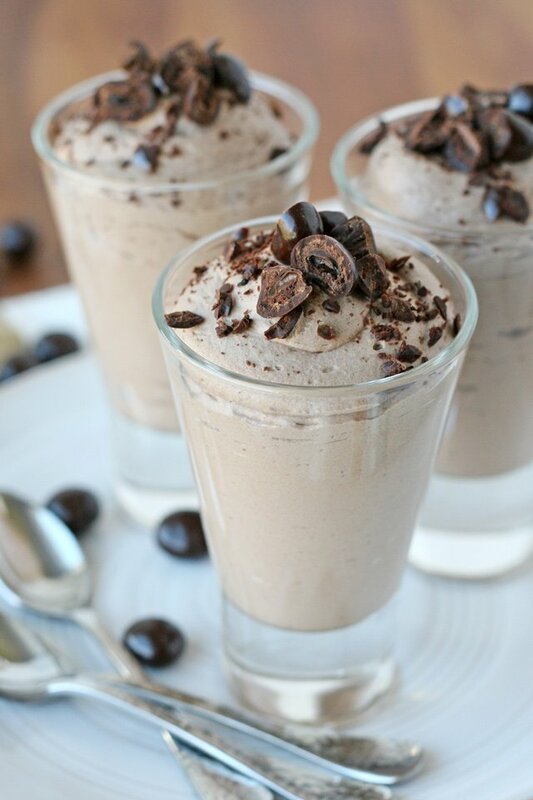 If you love chocolate and coffee together, this is the treat for you! This homemade mousse is surprisingly easy to make, and makes a beautiful treat that’s perfect for a dinner party… or anytime you need a special dessert! 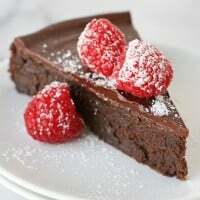 I’ve shared a delicious Chocolate Mousse Recipe on the blog in the past and still love that recipe. 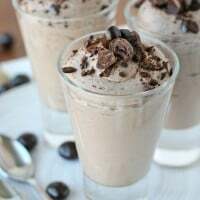 But when my friend Cathy over at Lemon Tree Dwelling shared her Bailey’s Chocolate Mousse a while back, it was simply so gorgeous I really wanted to play with the recipe. While her Bailey’s version looks amazing (and you should totally try it! ), I thought I’d experiment with a coffee variation. Ever since my recent Mexican Riviera Cruse with Princess Cruises I’ve been dreaming of the gorgeous cappuccinos I enjoyed every morning! I thought a coffee flavored treat might be the perfect way to remember my Princess trip. And what a delicious idea this was! 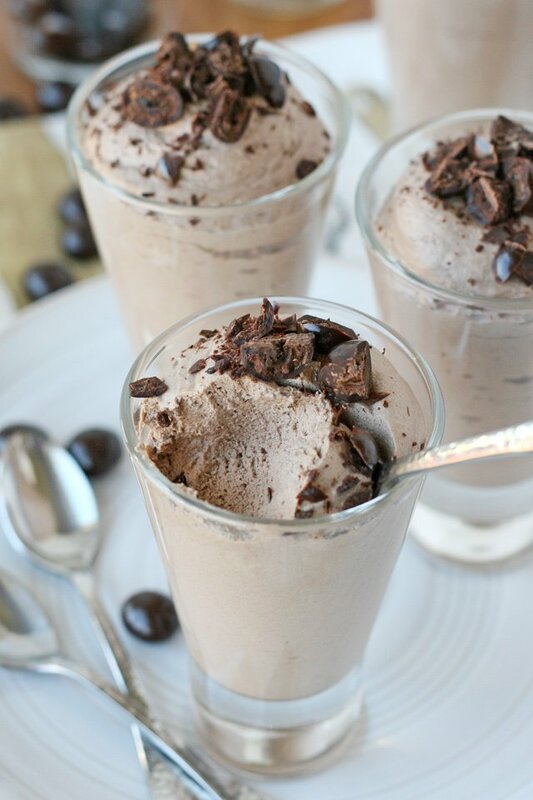 This Chocolate Mocha Mousse is creamy and fluffy, yet has a nice thick consistency. This mousse feels like such a fancy treat, but it’s so easy to make I can whip it up anytime I want… this could be dangerous! I garnished the mousse with chocolate covered espresso beans, but feel free to use chocolate sprinkles, a small cookie, or simply no garnish at all. Before gathering your ingredients, place mixing bowl and beaters in the freezer to chill 5-10 minutes. Chilling the bowl will help the whipped cream whip up faster and fluffier. In a small bowl, add 2 T. water. Sprinkle gelatin over water, stir, then set aside for 1 minute to allow the gelatin to absorb the water. Pour the hot coffee into the bowl of gelatin and stir until the gelatin is completely dissolved. Once fully dissolved, set aside to cool. Retrieve your chilled mixing bowl and add heavy cream. Beat cream on medium-high speed 1-2 minutes until it begins to thicken. Reduce speed to low, then while still mixing, slowly add powdered sugar, then cocoa powder and vanilla. Continue mixing, and slowly pour in the cooled coffee/gelatin mixture. Return mixer to medium or medium-high speed and continue to beat until well blended, fluffy and soft peaks form. Do not over-mix. The mixture will firm up as it chills. Spoon or pipe (with a piping bag) into your choice of small glasses or dishes. Chill at least 30 minutes before serving. Before serving, garnish with chocolate covered espresso beans, chocolate sprinkles, or your choice of garnish. The mousse can be made several hours in advance (and kept in the refrigerator), but I would suggest serving it the same day it's made. Looks delicious! 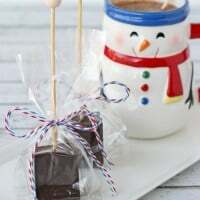 I love chocolate and coffee. I can totally see me relaxing in a deck chair under clear skies, nothing but blue water all around, the sun in my hair and . . . one of these babies in my hand! Your comments always make me smile! Thanks for your sweet words! OMG YUM! It looks so fluffy and tasty! Thanks Natalie! It really is so good! yummmm! how far in advance can this be made and still be delish? thanks!! As mentioned in the recipe, the mouse can be made several hours in advance, but is best served the same day it’s made. Enjoy! This sounds amaze-balls! 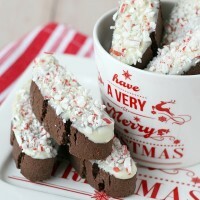 I will probably be trying this recipe soon, thanks for the great idea! Another great recipe from Glory! My tummy and whipped cream do not get along well, but I might have to try and figure something out to counteract it’s bad reaction, you know? It may just be worth it,… Your photos are gorgeous, as usual, too! Looks amazing! 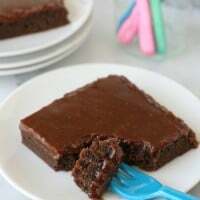 Is there are a substitute for the gelatin? I have only made the recipe as listed. Without the gelatin, the recipe is basically flavored whipped cream, which of course would be delicious, but it would not have the same thickness as the mouse I’ve shown here. These came out beautifully. Thanks for sharing!